March 22, 2018 Dan O.
It’s like A Walk in the Woods. But with more bears. And no comedy. 30-something-couple Jenn (Missy Peregrym) and Alex (Jeff Roop) are enjoying a trip away from the rest of the world in the back country of Missinaibi Lake Provincial Park, North of Chapleau, Ontario, where they hope to not only spend some quality time together, but see the sights. Alex also has a little idea in his head of possibly proposing to Jenn, but he doesn’t want to seem too pushy, as he just wants this trip to go by as smoothly and as enjoyable as possible. That all changes, however, when the couple are hunted by a savage black bear who won’t stop stalking them. Now, it’s up to both of them to focus on their strengths and survival-instincts to make it out of this adventure alive and, well, still a couple. 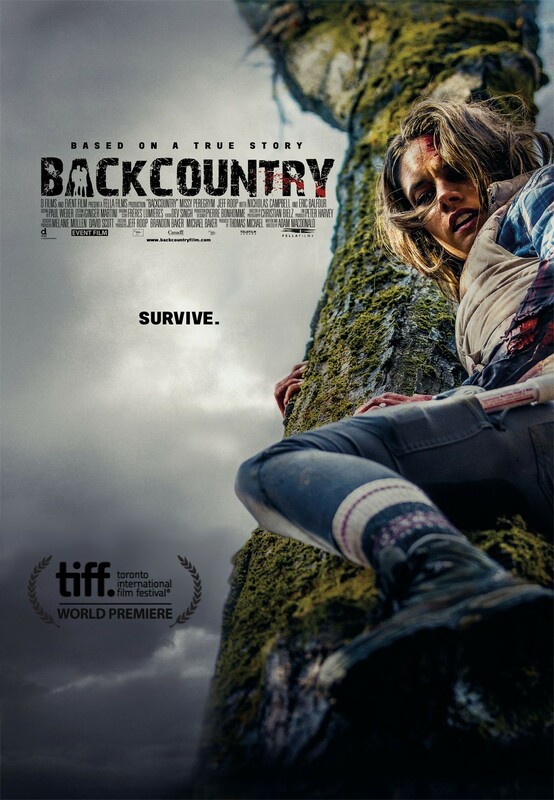 Backcountry is a lot like other nature-survival thrillers in that it features a few boring protagonists, an unpredictable forest that never seems to end, a dangerous foe, and oh yeah, lots and lots of jump-scares. But writer/director Adam MacDonald is somehow able to not just make it all effectively work, but make it even feel a little fresh. Who knew that watching an insufferably yuppie couple getting chased by a vicious bear could be so scary, so tense, and so nerve-wracking? Especially when you consider that the first half of the movie is dedicated to watching and listening in to this couple, their lives together, their relationship, and whatever little issues they may or may not have. And this is a good thing because MacDonald at least gives us character-development to work with, as opposed to just giving us five-minute introductions and allowing for the danger and scary stuff to begin. Nope. In order for a thriller like this to work, we have to care and somewhat identify with these people which, considering they’re being chased by a bear practically the whole time, isn’t all that hard. But MacDonald starts things off slow and mannered, making Backcountry feel like it’s going to sleepwalk its way to the finish line. Really, if anything, Backcountry is what happens when you take something of a conventional plot-line, and direct the hell out of it. MacDonald seems to really get us in the dirt, the mud, the blood, the rain, the grass, and up in the trees, to make us feel as if we are right there with this couple, as they’re on the run from this vicious killer bear. It works because the movie always feels like it’s got another trick up its sleeve and downright dangerous; MacDonald almost coaxes you into feeling as if you’re all safe and sound at points, only to then hear a “roar” moments later and know that, oh yeah, it’s time to run. And it’s why Backcountry is such a surprise: It’s thrilling, exciting, and downright terrifying, while still not doing entirely anything new or game-changing. Then again, it didn’t really need to, in order to work. All it needed to do was get us to care, shock us, and even better, make us feel like we weren’t watching 1,000 other survival-flicks. Consensus: Surprisingly scary, unpredictable, and disturbing, Backcountry is another survival flick that feels a tad bit different from the countless others in the same sub-genre. …and he was a bear desperately looking for some food. Who’s the real villain here?!? I’m glad you liked this! I saw it a couple years ago and I did too.